I love Magicjack. Where else can you get unlimited long distance for $20/year? If you haven’t tried it yet, check out my Magicjack review. 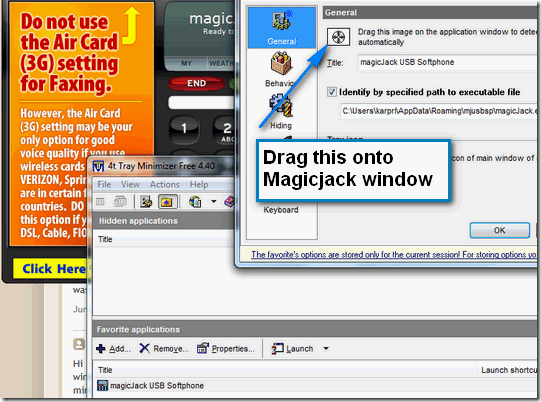 If you used Magicjack, you know you get a dialer in your desktop or laptop where you have the Magicjack software installed. One annoying thing about it is that, even when you are using your home phone, at the end of the call the Magicjack screen will pop up. In fact, if my wife was using the phone upstairs and if I was on the computer, it will popup when she dials a number and when she hangs up the phone. Grrrr.. Finally, I found a solution. Now I can stop the Majicjack window from popping up at all. I switched Magicjack to run as a Windows Service. We can also run Magicjack as a Windows service and we won’t see the magicjack window at all. But that is a little bit more involved and I will post a tutorial next week.